We, member states of the Climate Vulnerable Forum (CVF), met in Manila on 9-11 November 2015 to take stock of our progress and discuss the future direction of the Forum, with a view to preparing a common input to the 21st Conference of Parties to the UN Framework Convention on Climate Change (COP21). We recalled our Male’ Declaration, Dhaka Declaration and Costa Rica Action Plan, through which we led and promoted ambitious measures to address climate change, given that warming of just 0.75-0.85°C endangers our people, exceeds our capacity to cope and adapt, and places into question the very survival of a number of our low-lying states. We reiterated our #1o5C social media campaign, which calls for broader international support for a climate-secure framework at COP21to keep warming below 1.5°C. We welcomed the establishment of the Vulnerable 20 (V20) on 05 October 2015 in Lima, Peru as a dedicated new cooperation mechanism for the Ministers of Finance of the CVF to mobilize resources in support of CVF advocacies and priorities and foster a significant increase in investment in climate resiliency and low emissions development. We want an ambitious, universal, legally-binding, dynamic and durable international agreement at COP21. We call for this agreement to enshrine the critical goal of below 1.5°C, together with a successive 5-year commitment cycle to review and foster further ambition progression informed by the latest science. We call for this agreement to enable CVF countries to upscale their adaptation and mitigation action, as contained in their Intended Nationally Determined Contributions (INDCs), through additional enabling support on means of implementation. We call for urgent confirmation of a loss and damage mechanism building on the Warsaw International Mechanism including provision of support to climate risk management in developing countries. We call for an agreement that will ensure the protection and promotion of human rights, noting that climate change presents a clear and potential risk to the full enjoyment of human rights. We call for improved access to predictable, scaled-up climate finance and ensure a balanced allocation between adaptation and mitigation by 2020 and beyond; and for enhanced technology development and cooperation to foster innovation, diffusion and deployment. We call for an accelerated capacity development for pro-active climate action including mainstreaming of climate change into development processes. We will strengthen our national climate actions in order to lead processes to help trigger increased commitments from all countries to accelerate progress towards the goal of staying below 1.5o C. We recognize that our INDCs are the appropriate means to convey any upscaled commitments and emphasize that additional enabling support on means of implementation would be indispensable. 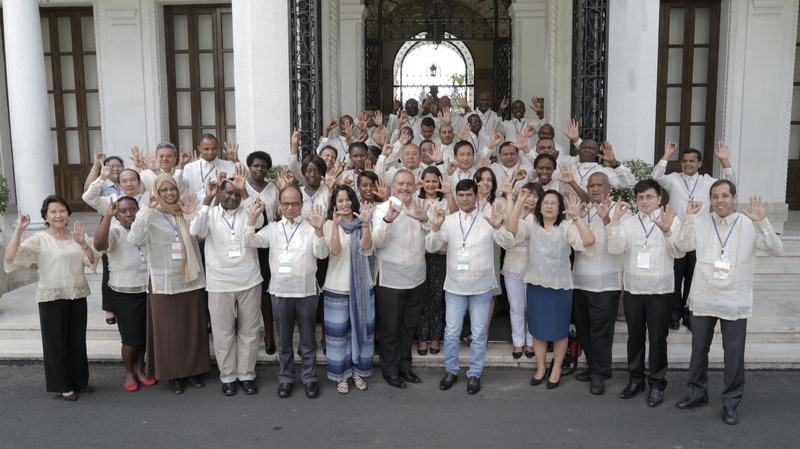 We will establish a South-South Centre of Excellence for Climate Information and Services in the Philippines to intensify our own efforts to exchange knowledge and best practices, to promote more effective national climate action, and to develop, incubate and apply innovative climate solutions among our member states. We will strengthen collaboration with the international community in our five focus sectors of health, human rights, labour, migration/displacement, and science, as identified in the Costa Rica Action Plan, and expand our focus sectors to agriculture, education, gender, tourism and water in view of the immediate and dire impact of climate change in these sectors. We will establish Task Forces, as appropriate, to take forward our work in these focus areas. We will work towards a new culture of international partnership on finance, capacity building and technology and note that enhanced material support is urgently required to assist our capacity-constrained nations to withstand the worsening humanitarian crises and large-scale development setbacks we face as a result of prevailing deficiencies in the global response to climate change. We will strengthen the CVF Trust Fund as a financing mechanism for CVF and V20 activities, endorse the Guidance for Capitalization, and encourage further contributions to the Fund from members and donors alike, acknowledging with appreciation the contribution of Bangladesh and other donors to the Fund to date. We will intensify and expand collaboration with all stakeholders, including civil society groups, business, academia, scientific research institutions, faith-based groups and others committed to achieving progress in addressing global climate change and supporting countries most vulnerable to its effects. We will meet again at a High Level Meeting in Paris on 30 November 2015, in conjunction with the commencement of COP21, to adopt the Manila-Paris Declaration and 2016-2018 Road Map that will embody these ideals and identify actions that will deliver maximum protection for countries most vulnerable to climate change through urgent, expanded and effectively delivered responses. We welcomed Burkina Faso, Cambodia, Comoros, Dominican Republic, Democratic Republic of Congo, Fiji, Grenada, Guatemala, Haiti, Honduras, Malawi, Mongolia, Morocco, Myanmar, Niger, Palau, Papua New Guinea, Senegal, South Sudan, Sri Lanka, Sudan, Tunisia, Yemenas incoming members of this Forum, for confirmation at the CVF High-Level Meeting at Paris on 30 November 2015. We nominated the African candidate as the Forum’s next Chair for the 2016-17 period, for confirmation at the CVF High-Level Meeting at Paris on 30 November 2015. We thank the CVF Troika Expert Advisers Group and our civil society partners for participating in the meeting, and express appreciation to our donor country and UN partners for supporting the meeting and CVF activities.